The Honorable Mayor Helene Schneider will turn on the lights of a beautiful 25-foot Green White Fir to officially open the holiday season for the Waterfront! The 31st Annual Parade of Lights will start at 5:30 p. m. with some 30 boats motoring, sailing, and paddling the Santa Barbara Coastline. Judging for the parade takes place from the east side of the Wharf, and the Mayor will end the boat parade by lighting the tree to start the fireworks show and end your night with a bang. Take advantage of the opportunity to start your holiday season by having dinner, a treat or do some holiday shopping for your family and friends. Gift certificates are available at the Wharf businesses. 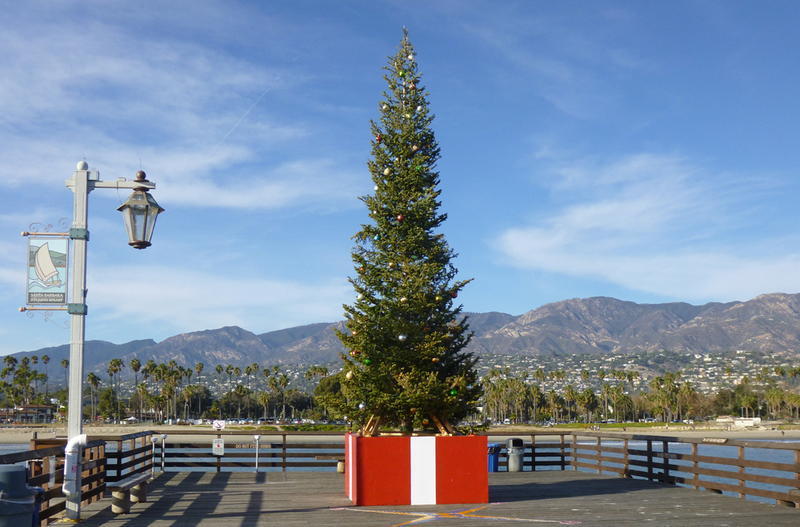 Parking is available on Stearns Wharf (before 3:30 p.m.) as well as at the Chase Palm Park & Garden Street parking lots. The first 90-minutes of parking on the wharf is free! Sponsored by the Wharf Merchants. For more information, visit StearnsWharf.org. Stearns Wharf is located in the harbor in Santa Barbara, California. When completed in 1872, it became the longest deep-water Wharf between San Pedro and San Francisco. Named for its builder, local lumberman John P. Stearns, the wharf served the passenger and freight shipping needs of California’s South Coast for over a century.